As previously mentioned, my Miata was originally delivered to the Carlsbad dealer with exactly one option - a $65 pair of carpeted floormats. Being a stripped-down base model, the only audio available to the new owners was the sound of wind rushing by mixed with a raspy exhaust. Look closely and you'll notice some mismatched plastic plates above it, filling the gaps from where the OEM unit would have been. 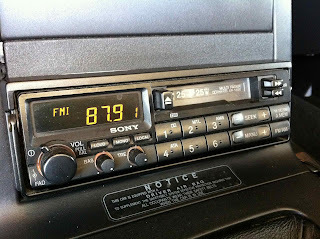 Listening to it was literally painful - at least until it warmed up. 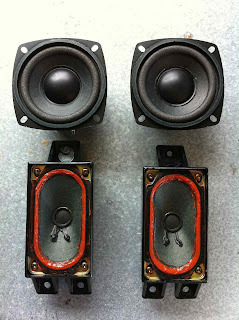 When cold the deck would create a various fog-cutting shrieks of feedback whenever the volume knob was adjusted within the range you'd want it to be. Too quiet? No feedback. Too loud? No feedback. In the volume sweet spot? Horrible feedback. And since I didn't like how the deck's LEDs didn't match the lighting in the rest of the car, the easy decision to yank this out was made. So what next? 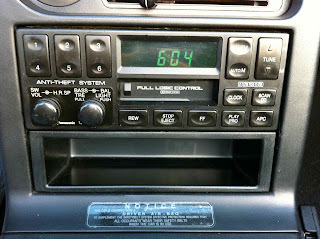 Originally the plan was to buy a modern CD deck with a detachable face and iPod connectivity for about $175. However, doing a little research I determined that this might not be the best option for the car and it's easily-slashed convertible top. And I've had about five nice car stereos stolen over the past twenty years. Bouncing around on miata.net, I discovered Jeff Anderson, a Miata enthusiast/electrical engineer who breathes new life into OEM Miata head units. 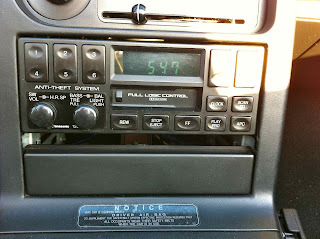 Not only that, but he adds auxiliary input connections to the decks so that one can play their iPods through the original radio without having to resort to a cassette adapter (and unsightly, extraneous cables). 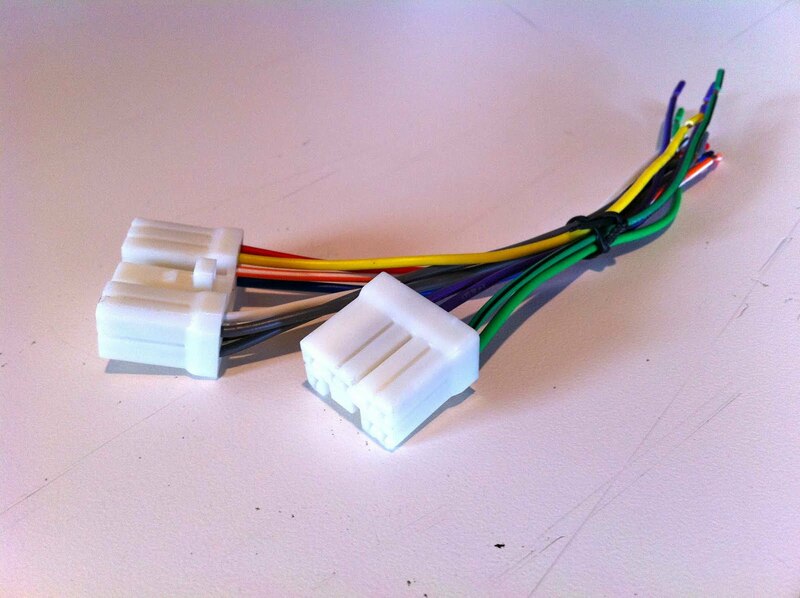 And I just happened to have an OEM head unit - it came included with the car in a box of miscellaneous parts. I also had him include an inexpensive set of replacement headrest speakers for $50. Including two-way shipping, I'm now in over what I would have paid for a modern deck. 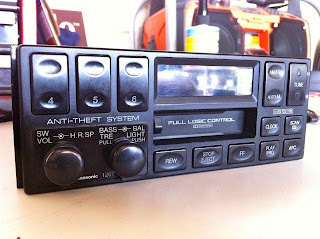 But this one is theft-proof (no one wants a twenty year-old tape deck at this point) and will be well-integrated into the car's interior. 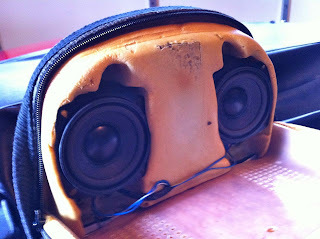 First up - the headrest speakers. 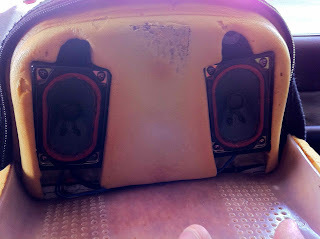 They were so bad that I had to adjust the fader to 100% front speakers. Those were pulled and put in the box of Miata parts. Here's a comparison of the new (top) and original (bottom). Each headrest has a left and right speaker. Repeat on the other side and I actually have usable rear speakers. Covers zipped up and you'd never know that speakers resided within. And, most distressingly, no OEM wiring harness into which the OEM head unit would be plugged into. So off to eBay for a replacement. Thankfully only $4.6, including shipping. A few days later and it arrives in the mail. 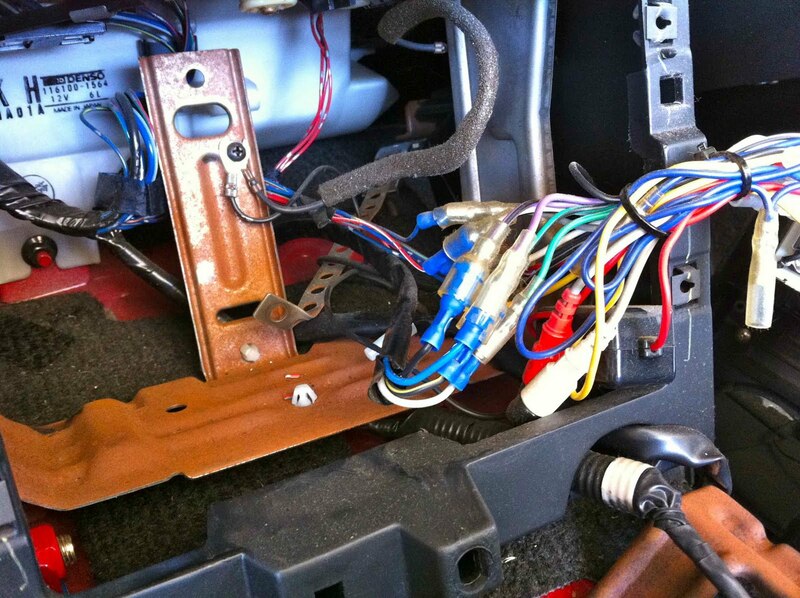 A Saturday afternoon was spent tidying up and decoding the wiring and installing the harness. 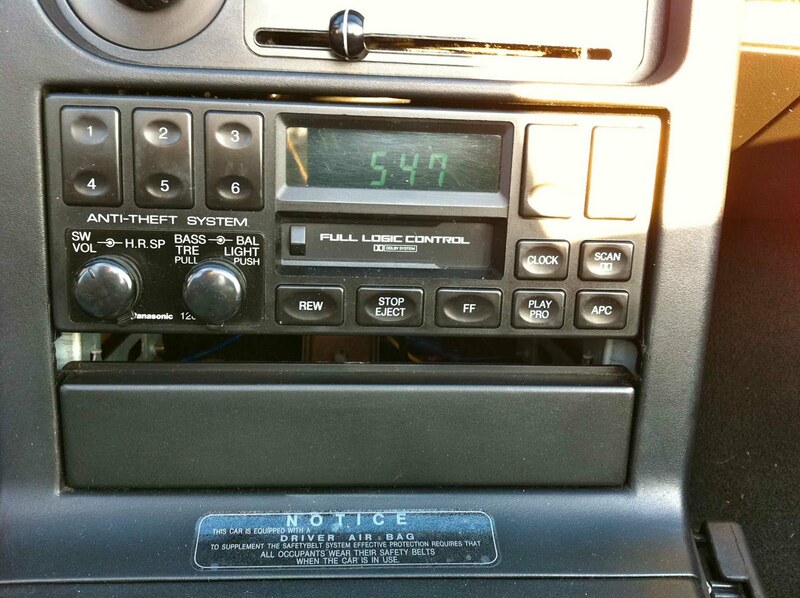 The head unit is plugged in and works just fine. The auxiliary input cable is discreetly run below the center console and pops up inside the arm rest lockable cubby - the perfect place to stash an iPod. Now to procure the correctly-sized trim piece that fits below the deck. Wallet and/or phone can reside here when the car is in use. 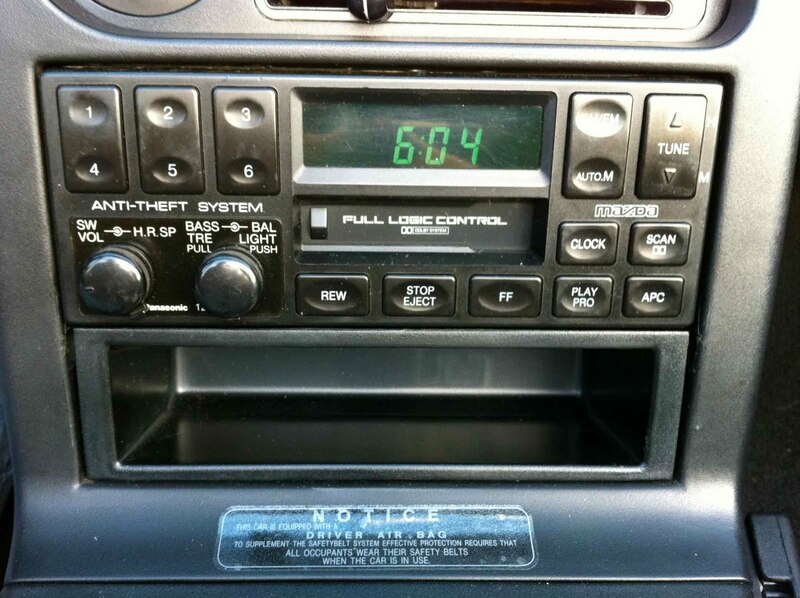 I'm probably the only person who geeks out about installing a twenty year-old tape deck in his car. But it looks good, sounds decent (good enough for a noisy little convertible) and will hopefully never be stolen. 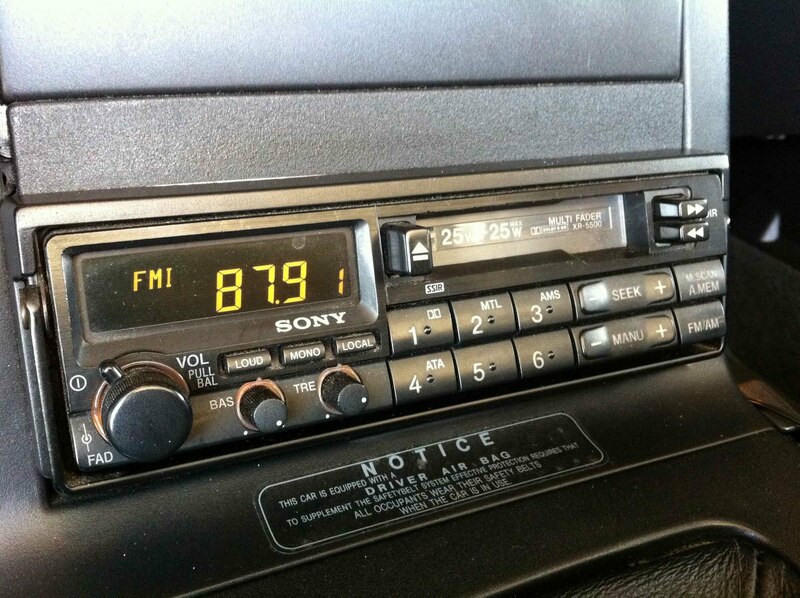 It'll probably never see a cassette. 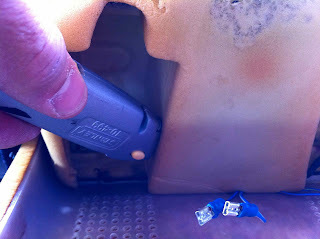 And yes, I finally broke down and removed the unsightly airbag warning sticker from the console.